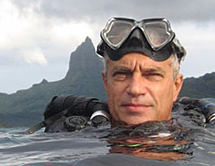 Louie Psihoyos, Executive Director of the Oceanic Preservation Society (OPS), has been recognized as one of the top photographers in the world. He was hired directly out of college to shoot for National Geographic Magazine and continued to create iconic images for the magazine for 18 years. His ability to bring humanity and wit to complicated science stories carries over to his filmmaking. In 2009, Psihoyos directed his first documentary film, The Cove, about an annual dolphin hunt in a secret cove in Taiji, Japan. The film suggests a microcosm of a larger picture: man’s disregard for the planet. Winner of the 2009 Oscar for Best Documentary Feature, the film has garnered over 50 awards from festivals and critics in the US and internationally.